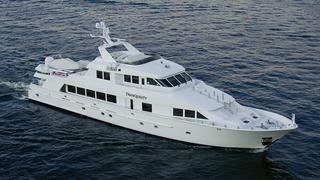 More news from Mark Elliott at IYC as he signs the 39.6m motor yacht Tranquility for sale. She was built by Hatteras in 1995 and has a great charter layout accommodating 10 guests in 5 staterooms. She underwent a massive transformation in 2006 / 2007, with her owner sparing no expense in updating and upgrading this well known vessel. He hired the award winning design team of Claudette Bonville & Associates to create a new interior which features warm earth tones throughout. At the same time her mechanical, plumbing and air conditioning systems were upgraded and engines rebuilt. Tranquility is asking $5.9 million, which Mark says makes her one of the best priced tri-decks on the market.